The Navy's foremost show is a great chance for the Senior Service to show off their kit and hard work to the taxpaying public, and they usually go all out in that respect. 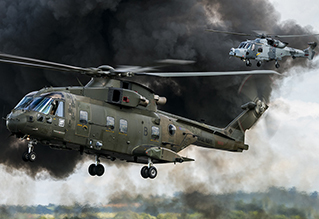 Last year's Air Day saw the final time the Junglie Sea Kings would attend the Somerset show and this year's show marked a similar farewell to the Lynx HMA8, the type making its last appearance in the world-renowned Commando Assault demo. Sam Wise travelled to deepest, darkest Somerset to report from the Yeovilton International Air Day. Photography by author. This year's show was used as the launching point for the 'rebranded' Fly Navy Heritage Trust and Royal Navy Historic Flight, now known as Navy Wings. The new organisation was certainly well-presented, with its own pavilion next to the crowdline and a whole host of branded literature and banners on display. Its aim is to bring together the RNHF's collection with 'associate' aircraft such as Wasp HAS1 XT787 and Kennet Aviation's Texan to tell the story of British naval aviation across history - it should hopefully lead to a stronger representation on the circuit for these historic and sometimes overlooked aircraft. Appropriately, a good deal of these associate aircraft flew at the show under the theme (or were meant to, the Texan sadly not making it up on the day), with a memorable highlight being Terry Martin pedal turning his Wasp down almost the entire length of the crowdline! The 'core' aircraft include the much-loved Fairey Swordfish, with the Mk1 in the flying display this year and Mk2 in the static park. Air Day 2016 saw some very strong international participation in both the flying and static displays, including the return of a USAF C-17A Globemaster III (which brought its own 'Mini-Me' that the crew assembled and parked up next to the aircraft! ), a trio of F-16s from Belgium and the Netherlands and an outstanding flying display from a pair of French Navy Rafale Ms. 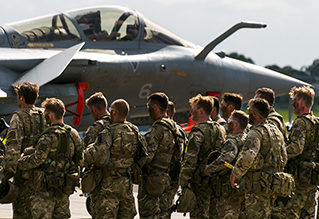 Taking home the award for Best Fixed Wing Display, the pilots followed on from last year's excellent Rafale M/Super Étendard Modernisé joint display and gave a masterclass of power, noise, flair and agility. The routine saw a number of formations, singleton manoeuvres and tail chases that seemed to finish all too quickly. 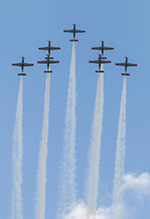 At a slightly different pace, but also very well presented, were Poland's Team Orlik making their Air Day debut - favouring graceful formations over raw noise and power. These were joined by a supporting Polish C295M and the familiar Navy M28 Bryza in the static park, the latter taking the shape of the specially marked Battle of the Atlantic airframe. Whilst it may have been a case of quality over quantity, it's refreshing to see the Navy's show attracting some exclusive foreign participation. The show's poster girl - literally - was the unique, powerful and beloved Sea Vixen, seemingly enjoying a new lease of life since ownership was transferred to the FNHT. Simon Hargreaves, whilst limited by weather to the aeroplane's flat display, nonetheless flew the socks off the machine with a very energetic performance. The author and journalist Frederick Forsyth spoke about the aircraft during the display, but might have chosen a better introduction to the type than describing the DH.110's horrific 1952 Farnborough crash... somewhat grim, but not enough to overshadow the display. It cannot be overstated how lucky we are to have the type displaying in the UK on a more regular basis. Another flying treat of the day was the Norwegian Historical Squadron's MiG-15UTI. The aircraft was sadly unable to make its planned appearance last year but certainly made up for it this year with a sprightly display juxtaposing its age and size. It's easy to see why it was considered such a formidable fighter of its day, offering a flowing and speedy display that managed to include several topside passes. In the current climate we're fortunate to see any classic jet displays at all, let alone two such rarities presented with such finesse. On the vintage propeller-driven front, similarly strong performances were offered from Air Leasing's Seafire III and The Fighter Collection's Corsair FG-1D. Sadly unable to join up in formation as had been billed, their individual displays were well suited to the airfield's size, with the Seafire in particular putting on a much closer and livelier display than has been seen elsewhere this year. 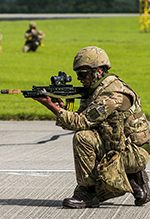 The centrepiece of every Yeovilton Air Day is, of course, the Commando Assault Demo finale, which shows to the public how powerful a well organised Marine force - supported by the Commando Helicopter Force's machines (and some from other branches) - can be. There was a noticeable absence this year: for the first time there were no Junglie Sea Kings taking part, and it definitely lacked a certain amount of character as a result - not through lack of punch from the other machines, but simply by the loss of that most charismatic of helicopters. But out with the old, and in with the new as the CHF's Merlin HC3/3As stepped up to the plate to perform the old King's duties - and they performed those duties with aplomb. It can't be denied that the Merlin has a large amount of presence in the sky, and with six airframes in total (not to mention the Army Air Corps Wildcats and Apache and a Fleet Air Arm Hawk) dashing across the airfield dropping off Royal Marines and vehicles, no amount of spectacle was missing from the display; we even saw Merlins dispensing flares for the first time which was much appreciated by the spectators. Opening with a resounding "Poseidon's Beard!" as the 'terrorists' began their assault, Lt Cdr Alan Petch did a great job of narrating the action in front of the crowd and must be commended for his humour and excitement throughout - it's safe to say he was enjoying himself as much as the audience! Sadly, Yeovilton's problem with photography of the static display continues. 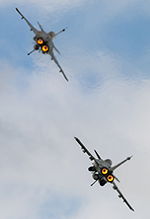 Whilst it's unrealistic to expect the show to ditch all of their metal barriers in favour of a RIAT-style cone-and-string affair, it was disheartening that many of the Navy's own aircraft are spaced out sensibly to allow for good photography to be had yet barriers are situated less than a metre from them in some cases. The international participants were - fortunately - generally well positioned (ironically the static photography of the Textron Airland Scorpion was much better at Yeovilton than at Fairford where it is penned in somewhat) but for the home team to be so fenced in is frustrating, especially at a venue with a south-facing crowdline where photography of the flying action can be difficult. Having said that, photography is a secondary concern to the quality of the show, and the flying display this year was remarkably well-paced. Although altered from the timetable appearing in the programme, the running order was spot-on in keeping the fast and noisy items apart with more genteel or graceful acts slotted in between. 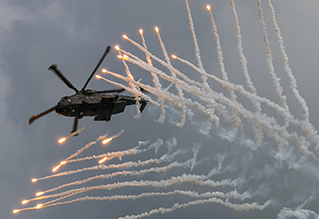 The show was opened by a diamond-four formation of two Lynx HMA8s and two Wildcat HMA2s, representing the old and the new. Acts such as Rich Goodwin's ever-impressive Muscle Biplane display and Sally B (visiting the airbase for the first time in 16 years!) were welcome periods of slower pace between the jets and pyrotechnic displays, and there was even a half hour lunch break that managed to coincide with the worst shower of the day - credit to the organisers for that one! It's a sign of a good show when the only real complaints are that barriers are too close to the static aircraft; the little touches that make the show so well regarded (an excellent value souvenir programme, with 80 pages of high quality content for just £5, a great sense of humour from the senior service in both the commentary and the participants and a very relaxed feel to the event) keep their hold on the venue, and the Commando Assault finale is still worth the trip by itself. With a considerable increase in naval noise and hardware expected in a few years time, the Fleet Air Arm is doing a fine job of keeping its profile up ready for its increase in capabilities.